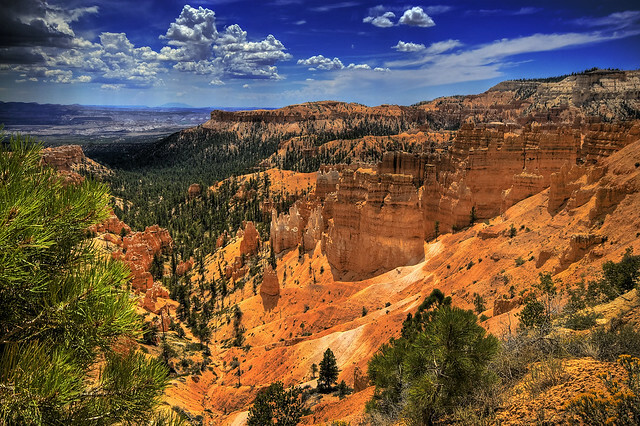 This is a great picture from Sunrise Point in Bryce Canyon that should make anyone who sees it wish they were in Bryce right now. Most images from sunrise are the bland ones taken just from the top of the same view you’ve seen hundreds of times. This one’s different and that’s why I had to share it. There are so many places in Bryce to hike to, to see, to take pictures of. It is the pictures done from different perspectives that really catch my eye. If you can highlight the stunning beauty of Bryce in a way that isn’t often done then you have my respect. To often people just drive along the rim of Bryce to take pictures from the lookouts, but I hope that these lookouts inspire people to go hiking in Bryce. To get out of the car and take a walk. Sure it may take some effort, but to see up close what you’ve only seen from the top is definitely worth it. To see the hoodoos for themselves standing there resolutely is just inspiring. So take a ride, then take a hike, that’s how you see Bryce for what it really is.